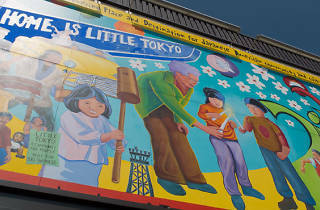 Photograph: Chelsee Lowe Home is Little Tokyo mural. 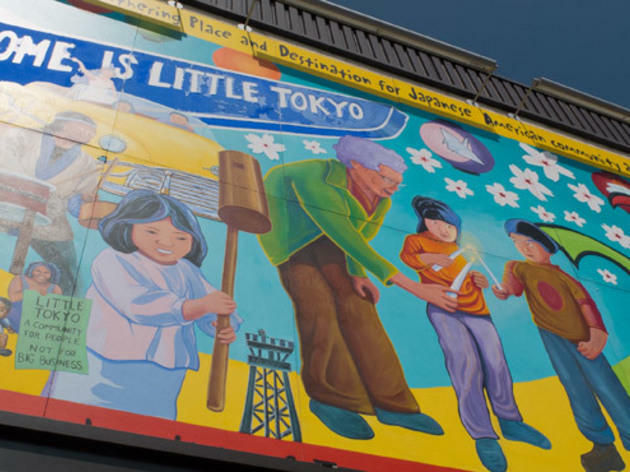 The colorful Home is Little Tokyo mural, finished in 2005, acts as a visual metaphor of Little Tokyo’s history: A little girl stands in the forefront, banging both mochi and a guard tower from WWII internment camps; Charlie Parker plays the saxophone beside taiko drummers to represent the area arrival of African American culture in the ‘40s; and the central image of an elderly woman lighting candles with two children notes a tradition to remember the unjust treatment of marginalized groups throughout world history. Ideas for the mural came directly from community members who later painted alongside muralists Tony Osumi, Sergio Diaz and Jorge Diaz.